"Can you shed some light on travel advisories? Some friends are telling me I shouldn't travel. Where can I get information?" Travel Advisories... OK you need travel advice, but it shouldn't necessarily come from your friends when it comes to your safety. We're told all the time that we're crazy to go some of the places we do... but we really don't think we take chances. What you need to know about are Travel Alerts and Travel Warnings. These are issued by governments all over the world to tell their citizens which countries or parts of countries might be dangerous or of concern. ...So just because a government issues one of these, it doesn't necessarily mean that it's a bad idea to plan a trip to that country. What Makes It Into Travel Advisories? Terrorism probably tops the list. Terrorism has been in the news for years, especially since 9/11. There have been earthquakes and other natural disasters that have triggered warnings and alerts. We get nervous with some of these too. ...but we went later in the year with no problem. 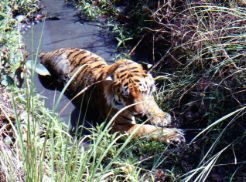 We went to India looking for Tigers years ago. There was political unrest way in the west of the country, but not where we were headed. We read all the warnings, but went and had a wonderful trip. Bird flu, SARS, Ebola. We wrote a page on disease outbreaks and how they can affect travelers. We went to Southeast Asia during the bird flu. No real concerns and no problems. We probably won't be going to areas with Ebola, but we do applaud all those great people who helped with the crisis. When we went to El Salvador and Nicaragua, we were a little concerned about the warning of high crime area. Our solution was to arrange for a knowledgeable local guide to help us. That not only kept us safe, it made our trip better! If you want to be a traveler, you need to learn to weigh the warnings and the news. You may decide that it's worth it to travel anyway. Terrorism is nothing new; different areas have had unrest in the past. Read those advisories, take them seriously, but decide if what they are talking about will affect you and your trip. Don't trust them blindly and just stay home forever. Travel advisories are issued for a number of reasons. Terrorism and wars are the scariest among them. They can be issued because of natural disasters, political unrest, disease outbreaks or high crime areas. You need to read to see if these are long term warnings or short term travel advisories. We think it's a good idea to check with several different sources... as English speakers, we check to see what the governments of Australia, Canada, the U.K. and the U.S are saying. They don't always agree. So if there are differing points of view, what should you do? ...with 1 being "Exercise normal precautions"
... 2 is "Exercise increased caution"
... 3 is "Reconsider travel"
... and 4 being "Do not travel". This is clearer than the old system which was various warnings and alerts that didn't always make sense to us. You can also go to Country Specific Facts for information on road conditions, food and water safety. Some of THAT information can be scary to read... but it shouldn't keep you home... It's just good information to have. How Should You Use These Advisories? Keep in mind your tolerance... will that warning or advisory worry you all through your trip or is it something you can just keep vigilant for and still enjoy your travels? US citizens can also enroll in the STEP program. This is the Smart Traveler Enrollment Program. It lets U.S. citizens traveling abroad to let the U.S. Embassy know you are there. We have used this a couple of times... and we still get safety notifications about the countries we registered for. Is the whole country affected? I mentioned our trip to the center of India to several national parks to see tigers. There was unrest in the northwest. We read the travel advisories. We felt the problem was half a continent away, and we'd be fine. ...and we saw tigers every day. I'm so glad we didn't cancel. What we're trying to tell you is if there was a natural disaster or political unrest in one part of the country, the part you're going to may be fine. Health outbreaks and political unrest may be confined to only one area of a country, leaving the rest perfectly safe to travel in. Are the threats to tourists or tourist areas or is there violence in isolated and remote areas where there is less possibility of it affecting you? We had friends who had planned a trip to Egypt and Jordan. They wanted to bike the Valley of the Kings and Petra. Then the Arab Spring hit Egypt. What did they do? They went anyway. Now, I might not have, but they say they felt safe the whole time. There were no tourists (I wonder why?) 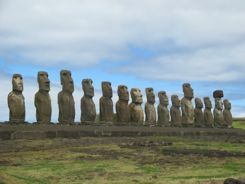 so they got room upgrades, the people were glad to see them and super welcoming... and they had a great trip. Check to see how long ago the advisory was posted. Some warnings are long term, but you can check to see if the conditions that prompted the advisory have changed. What Should You Do If You Go? Dress and pack to avoid calling attention to yourself. This is smart travel anytime, but especially if there is a travel advisory. Stay in local hotels, eat in local restaurants. Small places are generally less apt to be targets. Take the phone number for your country's embassy so you can contact them if necessary. Consider registering with the embassy to let them know you're in the country. You might want to consider travel insurance, but this is tricky... there are many situations that cancellation insurance doesn't cover. If war is breaking out or if the local terrorists are targeting tourists, you probably should reconsider your travel plans. With a travel advisory or warning like that, you might want to find a country that is safer and friendlier or travel to a new part of your own country. Almost all travelers can find adventure even close to home. So evaluate those warnings for yourself. Change your plans if you feel you need to, but travel somewhere. It's good for you.